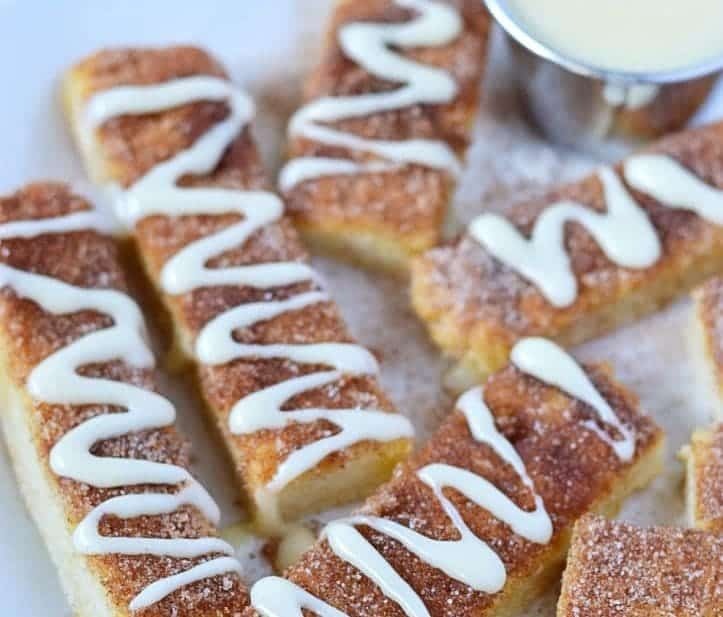 These gluten free sugar cookie bars bring all the flavor from frosted sugar cookies without the extra work. They make a great easy, crowd-pleasing dessert! I first posted this recipe for gluten free sugar cookie bars way back when I started my blog. Only, at the time, I wanted to appeal to a broader audience so I didn’t title them gluten free. It was also around Halloween so I called them Sugar Cookie Bars with Halloween Sprinkles. It was such a great recipe but I put the recipe in such a tiny little box, nobody was going to find it. Not only that, but the pictures were awful. A-W-F-U-L. They’re so bad, I get embarrassed when I share the recipe. At the time I took them though, I thought they were great! Boy have things improved around here. I can’t even look at those old photos without cringing and wanting to cover my eyes. Not to different from when I’m watching a horror movie actually…. Although the photos have changed, I didn’t play with the recipe much. 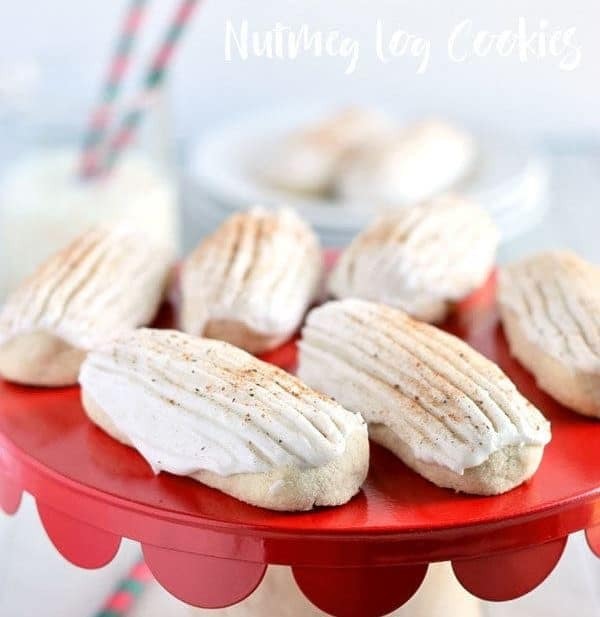 I just wanted to bring it back to life and make it an evergreen gluten free recipe that was easy to find, easy to make, and great for any time of the year. 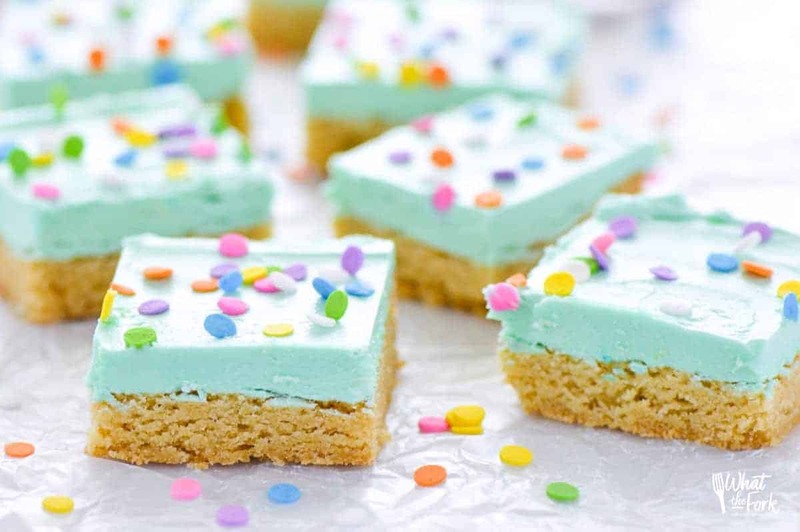 These gluten free sugar cookie bars are exactly that. I really, really love the cookie base in these bars. It’s kind of soft but the edges are nice and chewy. And then you add the frosting and it just sends them over the top. 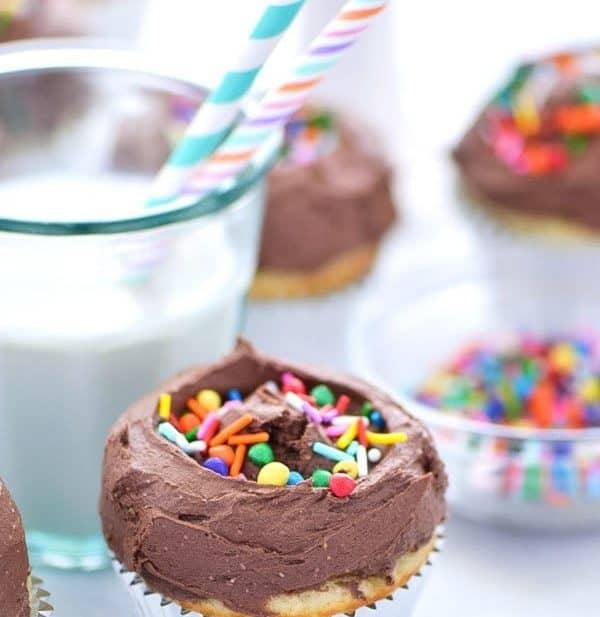 Plus there’re sprinkles – you can’t forget the sprinkles! 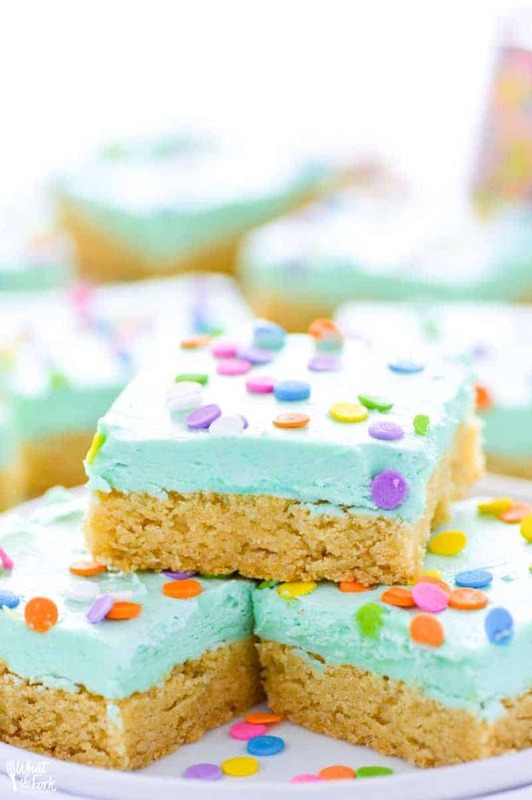 I topped these sugar cookie bars with my favorite vanilla buttercream frosting. It’s really easy to make and it’s so light and creamy. It’s also the same frosting I use for my Gluten Free Soft Frosted Sugar Cookies, except that one is dairy free. I also use it to make my Gluten Free Funfetti Cake recipe. With that one though, the buttercream base is the same but it’s made with almond extract instead of vanilla extract. The almond extract gives it a subtly different flavor that work well here too if you prefer. 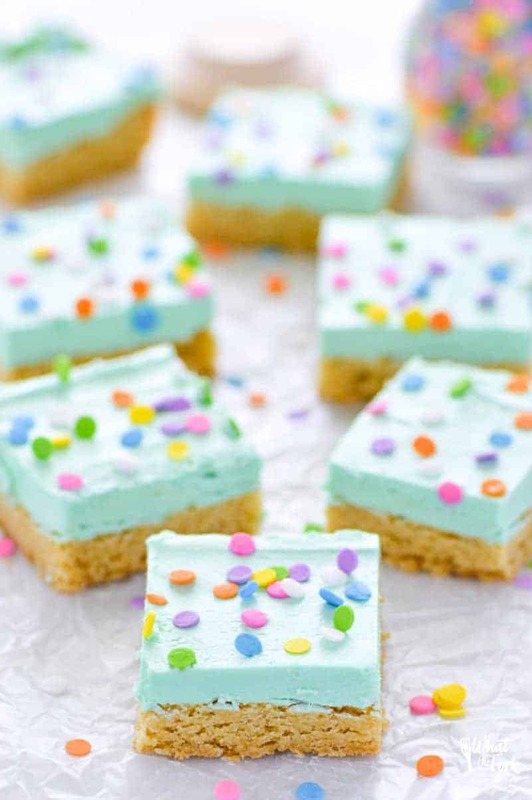 Either way you make the frosting, it will be great with these gluten free sugar cookie bars. Enjoy! This gluten free sugar cookie bars recipe can also be found on Food Fanatic where I am a regular contributor. These cookie bars are wonderful! Thank you and that is a great idea! 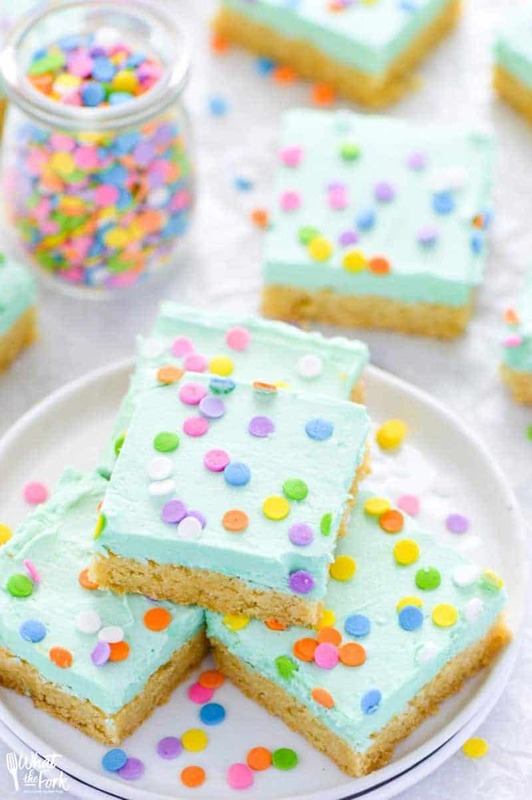 I’m now craving these gluten-free sugar cookie bars. They look soooo perfect. OMG yummy! I bet I can’t recreate them as beautiful as this dairy-free, but I’m willing to try! So bright! These are the cutest! I want one right now!! So festive! I am loving the frosting to bar ratio. So yummy! These bars look so fun and festive for the holidays! I’m sure they’ll disappear quick! These are absolutely adorable and drool worthy! Such an easy to follow recipe! These look so yummy, and they’re definitely smart! Bar cookies are so much quicker to whip up! Ohhh these would be perfect for my gluten-free guests. I love the idea of gluten free dessert. I want to see one of the original photos! Where can I see one? These would be so adorable for showers and teas. They could be made to match any theme! Wow! I’ve never thought to make a cookie bar…genius idea! And they can be frozen? They would be perfect then to have as on-the-go desserts at birthday parties for my daughter. Haha – I love updating the photos on some of my early recipe posts! These are GOR-geous! They look so inviting and festive! Oh geez, you always post the most incredible-looking desserts that I shouldn’t be looking at before lunch!! I can’t get over how amazing these look! All of that frosting! Thanks Audrey, the frosting makes these! These bars look amazing. I love how fluffy the icing is! Can this recipe be doubled for a 9×13 size? While I haven’t tried doubling this recipe, I’m fairly confident that it would work well. Just adjust the baking time as needed.